Imtiaz Cajee wants companies that benefited from apartheid to support justice initiatives for families whose loved ones died in police custody. The prosecution of the apartheid policeman implicated in the murder of slain activist Ahmed Timol should encourage civil society and big business to fund justice initiatives for other families who lost loved ones in police detention, his nephew says. Yesterday, 47 years after the anti-apartheid activist died, former sergeant Joao “Jan” Rodrigues was formally charged with murder and defeating the ends of justice in the Johannesburg Magistrate’s Court after handing himself in at Central Johannesburg Police Station. Formerly known as John Vorster Square Police Station, this was where Timol fell to his death from a 10th-floor window in what was initially ruled a suicide in 1971. 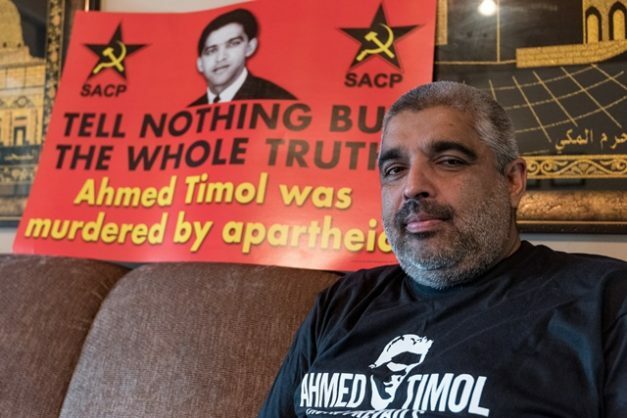 For Timol’s nephew, Imtiaz Cajee, it was a pivotal moment in his own personal journey to uncover the truth about Timol’s death. Cajee said he wanted the case to give hope to other families of victims who met a similar fate under apartheid police custody. “It forms a broader part of the reconciliation project that we need to be embarking upon and what the Timol case has demonstrated is that, as a collective, we have reached a particular stage that requires funding, capacity and resources which individual families do not always have at their disposal,” said Cajee. He called on organisations in the private sector that benefited from the apartheid regime to play their part, saying it was not only up to the state to ensure such cases were heard. “What we need is big business, for example, to step in on these initiatives and start supporting them. These are the same businesses which were quite comfortable supporting the apartheid regime and nobody speaks of these cases. The former security police branch sergeant was granted R2 000 bail. Rodrigues, known as the last person to see Timol alive, admitted last year there had been a cover-up of the details of Timol’s death. “Police officers pressurised me. I was advised on what to write in my statement, which was not true,” he said, testifying in an inquest into the death. Last year‚ the High Court in Pretoria ruled that Timol did not commit suicide‚ as concluded by apartheid-era investigations.